If you’re looking for yet another option on what’s shaping up as one of the year’s busiest arts weekends, here’s the latest in a series of happenings from the group known as The Drift. The group specializes in free, multimedia riverside events. This Friday’s, titled H3O/003, takes place on the north bank of the Allegheny, right beneath the bridge. It includes site-responsive video projections, live music and interactive new-media works produced by local and international artists. 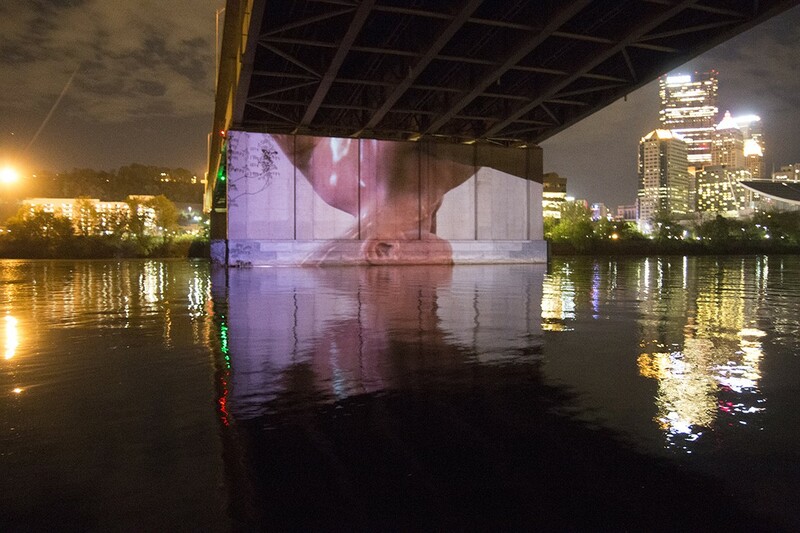 At the previous event, H3O/OO2, in May, digital animations and other experimental video were projected right onto the wide concrete face of the bridge’s off-bank support structure. See the photo at left or this rather trippy video for more. According to Drift co-founder Steve Gurysh, this Friday’s event includes work by 10 visual artists and three live performances, by Sacramento, Calif.-based musician Elysia Crampton; Detroit-based Complex Movements, who combine hip-hop music and video; and Pittsburgh-based composer Jesse Stiles, who'll offer an electronic music work and video. Audiences can also watch from kayaks. Kayaks will be on hand, or you can bring your own. H3O/OO3 is co-presented with the Center for Urban Intervention Research, part of Carnegie Mellon University’s Frank-Ratchye STUDIO for Creative Inquiry.